The myriad human emotions of Wuthering Heights had left me hyper excited since yesterday, so I decided to read something light to soothe my frayed up nerves. 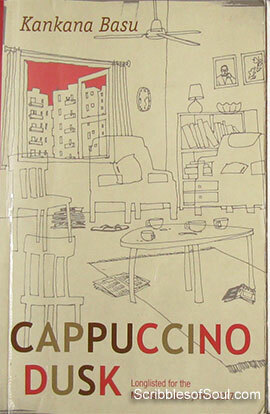 With this intention I picked up Cappuccino Dusk by Kankana Basu. A quick glance at the arrival of Banerjee clan in the city of Bombay, armed with the formidable tools of adult gripe water, Boroline cream and mosquito nets brought a huge smile on my face and convinced me beyond doubt, that this is the appropriate novel for my current state of mind- a breezy, spicy, conversational fiction. Well, Cappuccino Dusk is simply put a collection of myriad characters comprising of cynical Som, feminist Bonny, creative Sid, beautiful Mishti and their strange yet adorable friends, who meet every evening in the Banerjee household to drink a cup of coffee and indulge in “the most scandalous, improper conversation for a middle class Bengali home”! This seemingly simple storyline is fantastically treated by Kankana Basu to create an entertaining novel, where each character grows during the storyline and is transformed into something totally different. And, let me beware you, there is no dearth of characters in here. They range from sensitive animal lovers to peppy young journalists, hater of women and Muslims to stern celibate shaivites and stern dadi to lonely padosan. And Kankana devotes full eleven chapters, introducing the various actors of this colorful drama! This non-ending bevy of characters make the first few chapters seem disconnected as Kankana hops from one to another in an attempt to describe the basic background. However, once this task is done, the novel flows through a steady stream, with emphasis on one or two characters at a time. Though, the most likable one is Mustafa- the affable, self-proclaimed Sufi, with a humorous yet logical philosophy of life and witty one-liners who managed to bring a smile on my face at every appearance. He talks in poetry and excels at translating some of the most loved Hindi songs into something totally unrecognizable and hilarious. However, the novel is not just about smiles and laughs. It does touch upon some serious subjects like environment, animal hunting, schizophrenia, but all in a light vein. Once in a while, the mood gets sombre, only to return to the joyous, gaiety of festivities. In the story, the serious characters get comical and the simpler ones get complicated. And inadvertently, you are imbibed into their argumentative world and are left wondering at some of the people ‘poaching the poachers’ and yet others, crossing the threshold of moral and social barriers. Though, I found the timeline of the story rather hazy. Pranoy Banerjee enters in the Introduction scene in Bombay and in the very first chapter, he is hung onto the wall, proclaimed dead for over five years! Till the very end, I hoped that the author would shed some light onto the years that followed between Pranoy’s entrance and exit from Bombay, but I was disappointed. Further, in her zeal to introduce the star of the show- Mustafa, the writer omitted the details as to when exactly Mustafa and Benuda meet Banerjee family for the first time, where were the Banerjees living before they enter Pushpa Milan, in Calcutta or in Bombay and whether this was before Pranoy’s death or after? Well, the novel is over, and I am left stranded with these unanswered questions. However, right now, I am brimming with Mustafa’s contagious devil-may-care attitude and ready to overlook n no. of incongruities and confess that I found the novel absolutely delectable – a yummy sour-sweet curry sprinkled with generous dose of masala. Mmmm I loved it.